The treatment programme at Chandos has been carefully crafted to ensure that each of our interventions readily complements the others; through engagement with our comprehensive structure of activities, each resident can begin to develop a more firmly rooted foundation, on which to build a better quality of life. Chandos is an abstinence-based programme meaning no use of any form of mind-altering substances will be permitted during treatment. Please see the treatment details below, and feel free to contact a member of our team for any additional information or support. This is the primary means of input at Chandos. This daily group provides a therapeutic space where you can talk honestly and openly about yourself as a man. Through discussion, feedback and therapeutic exercises, the group serves to stimulate and support the process of self-discovery and change. Clients will receive a ‘whole health’ massage from our experienced and highly qualified Massage and Body Work Therapist on a weekly basis. For people who have experienced abuse, massage and body work can offer the experience of ‘Safe Touch’. Our holistic massage therapist is skilled in supporting people who have experienced sexual abuse and numerous other conditions. Four weekly consultations in nutritional therapy, person-centred homeopath, personal health and fitness. Nearly anyone can take part, regardless of age or fitness. Gentle or strong - it’s up to you. The postures and breathing exercises energise your body both powerfully and beneficially. There is a weekly Shiatsu share. Shiatsu is an ancient healing art that involves applying pressure to the body’s energy channels (meridians) with either fingers, thumbs, hands, elbows or knees in order to rebalance the body’s energy and promote good health. It is a safe holistic method of staying healthy and full of vitality in an increasingly stressful world. Shiatsu helps discover new vitality - release stress and tension, benefit the nervous system, increase your self awareness, treat common ailments, strengthen your immunity, boost stamina and body awareness and helps you relax and feel good. All residents are given a copy of the course handbook and it is expected that everyone will complete the reading and exercises to give them a thorough grounding in their recovery. Other specific assignments can be given for particular conditions and circumstances, for example: co-dependency, relapse prevention, female dependency, pride, behaviour, trust, self-esteem, anger/rage. This list is not exhaustive, but is intended to provide an idea of available assignments when tailoring individual treatment plans. These groups are held when a new resident has been in the house for 5-10 days and they are attended by all residents. Their purpose is to allow new residents to share their life history with their peers. Taken from Taming the Tiger Within, by acclaimed Mindfulness teacher Thich Nhat Hahn. The readings are made before our community groups commence, after each lunch and dinnertime. These groups are held every Sunday afternoon, with the primary focus being on relapse prevention and related topics. The format is typically a six session rolling group, allowing each resident to cover each topic twice over a twelve week stay. Members of the group are encouraged to draw on and discuss past situations of failure and success with the aim of finding future solutions to remaining drug and alcohol free. An experienced SMART facilitator will be on site to provide encouragement and support for residents who would like to complete the on-line training for themselves. This includes registering at www.smartrecovery.org.uk and help with training. Those who are currently training or who have completed, are encouraged to facilitate/co-facilitate SMART in the community. Weekly sessions provide emotional and practical support in the transition to taking up your role in the community. The sessions are also used to identify a treatment plan which will be reviewed each week. Residents identify issues within these sessions and which will usually be explored further in the group therapy sessions. Shy people blossom and confident people become inspirational! These workshops create instant communities. The small, (10 max) non-judgmental and supportive nature of this group empowers and fosters trust and permission to be in the moment. This innovative and absolutely supportive approach can help increase your confidence, authenticity, spontaneity, self expression and effectiveness. 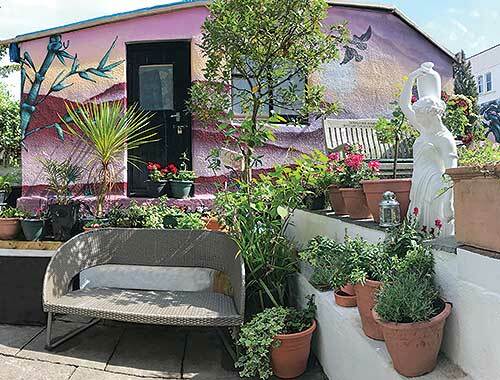 These sessions are held daily and involve an ever-widening range of techniques, including creative writing, yoga, guided meditation, auricular (ear) acupuncture, hula hooping, art therapy, singing, dance movement therapy, cookery skills, baking skills and drumming. The purpose of these groups is to teach residents creative, healing and relaxing ways of spending leisure time without having to resort to drugs. This activity programme creates space to make way for deeper intuitions and allows time for working through issues in between group work sessions. We have a fully qualified outdoor sports instructor who works with clients to overcome their mental and physical boundaries, and help in unlocking the potential that everyone has within. Activities include: climbing, mountaineering, abseiling, orienteering and other outdoor activities. Through the media of sport and recreation residents develop a healthy relationship toward exercise, fitness and health. This in turn fosters teamwork, communication, collective responsibility and a spirit of togetherness. And it’s FUN! Participants join the weekday community meeting in which they can voice practical or emotional concerns, make day to day decisions together and plan other events. This helps to create a close and vibrant community which makes everyone feel at home. In order to support this process, the roles of house leader, deputy house leader and housekeeper have been created. Chandos works within the spirit of the Community and this is central to everything we do. The Community Re-enforcement Approach (CRA) is achieved by working closely with the Workers Education Association (WEA) where a varied ever-changing range of activities and potential interests for residents are brought in-house. Senior residents are strongly encouraged to explore their own interests out in the community, be these vocational, hobbies or just fun activities with the aim of making an abstinence based life rewarding. Meditation teaches and fosters inner stillness and inner strength through deep relaxation, calming our thoughts to enable us to access feelings of joy and peace. We have a careers guidance officer who helps people who need support in finding voluntary work, training, education or employment, or to discuss their career options. Our Guidance Officer recognises that people in recovery have specific needs, which must be considered so that they can reach their full potential and take their place in society. work placements with a variety of local businesses, organisations and community projects.